Chemin des Adrechs de la Pigne, 83440 Seillans, Var. This stunning, 5-bedroom Villa provides the perfect setting to completely unwind in the lap of luxury, with classic Provençal countryside stretching below it as far as the eye can see. Le Domaine de Tamasea is very elegant throughout, with a gorgeous landscaped garden and a panoramic infinity pool, plus a resident cook to spoil guests with breakfasts, lunches and dinners which can be enjoyed al fresco while drinking in the views. "Le Domaine de Tamasea is truly a paradise - a beautiful house with superb views. It is a haven of peace and quiet, and a perfect place to relax, far removed from worldly cares." Carlton Rochell, New York, U.S.A. Le Domaine de Tamasea is an imposing south-facing house standing on a hill-top with panoramic views that are hard to beat anywhere in France. 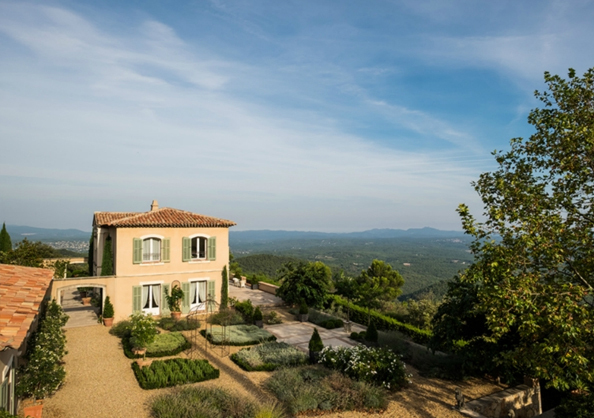 Extensive wooded valleys below the property stretch to the Massif des Maures, with the Mediterranean in the distance. The position and views are spectacular. ‘Tamasea’, together with its spectacular infinity pool and glorious garden, is a house of great style in a fabulous location and is wonderfully quiet and peaceful. The highest standards, as well as meticulous attention to detail, have been maintained throughout and the house is exceptionally light and airy, furnished, designed and decorated with impeccable taste and style. The accommodation is divided between the Main House, its adjacent Annexe and the Pool House. The floors are tiled in pale limestone throughout. Spacious hall - through double entrance doors and featuring an impressive 17th century Flemish tapestry and a curving staircase to the first floor. At its south end, wide, sliding glass doors open onto the magnificent south-facing main terrace (also accessed from the sitting and dining rooms). Cloakroom with a W.C., and a wash basin. Next door, a services room houses the boiler, electricity panels and a CD/tape player which has speakers in the sitting room and library. Sitting Room – through double doors and very elegant, with comfortable sofas and armchairs, an imposing working fireplace, a grand piano and French windows on 3 sides. Kitchen – bright, modern and well-equipped, with a breakfast table, double ovens, 4 electric hobs, a microwave, large fridge, a separate wine fridge, 2 dishwashers, a toaster, cafetière, Nespresso machine etc. There are French windows on its north side. Dining Room – with an elegant table seating 12 and French windows on the south and east sides. The east terrace leads to the covered dining terrace which seats 10 and overlooks the pool, pool house and a vast sweep of the surrounding countryside. Library/TV Room – off the sitting room, with a sofa and comfortable armchairs, a decorative fireplace, wide-angle TV receiving BBC, ITV, Sky and CNN channels, a DVD Player with DVDs, Broadband/WiFi internet access and French doors to the dining terrace. South-facing balcony - at the head of the stairs and accessed through large sliding glass doors. A door to the left leads to the owners' private suite. Bedroom 1 – bright and sunny, with a 5 ft double bed and French windows on its west and south sides. An en-suite (Bathroom 1) has a large bath, overhead shower and W.C. Bedroom 2 – simple and elegant, with twin 3' 6" beds, a sitting area and French windows on the west and north sides. An en-suite (Bathroom 2) has a bath, separate shower and W.C. Bedroom 3 - with a 5 ft double bed and French windows opening to the south. An en-suite (Bathroom 3) has a bath, walk-in shower and W.C. Bedroom 4 - with ornate, twin 3' 6" beds, glass-topped desk and French windows opening to the south. (This Bedroom is not available for children). An en-suite (Bathroom 4) has a bath, walk-in shower and W.C.
Kitchenette / Utility Room – with a 2-hob cooker, an oven, sink, fridge and deepfreeze. There are also 2 washing machines, a roller press (for drying), an ironing board and an iron. Covered seating area – this is the central feature with 2 comfortable sofas. Above and to the right of the pool house is a dining terrace overlooking the pool whose table seats 10, and is shaded by a large sun umbrella. Bedroom 5 - with twin 3' 6" beds and French windows opening to the south. An en-suite (Shower Room 1) has a walk-in shower and a W.C.
Kitchenette - with a large fridge and a dishwasher. Le Domaine de Tamasea is set in 4 hectares (10 acres) of garden and grounds, with a well-made drive leading from a gravel road to the garden side of the Villa, where there is ample parking space. The owners’ horticultural passion shows in the beautiful landscaping of roses, lavender, magnolias, oleanders, olive trees and many other varieties of flowers, shrubs and trees. A formal garden of lavender, box, roses, santolina and rosemary adjoins the House, whilst agapanthus, oleanders and cistus provide a profusion of colour throughout the summer. The garden provides several seating and dining areas, enjoying spectacular views over the countryside below. On the east side of the Main House, steps descend to the panoramic infinity swimming pool, measuring 14 metres × 7 metres. Roman steps descend to its shallow half (1 metre in depth), with the floor then sloping to 2 ½ metres. A wide ledge, 1 metre below the surface, runs round the deep end. There are 8 sunbeds, each equipped with a small pull-out table, and 3 sun umbrellas. The pool is filtered and alarmed. Le Domaine de Tamasea is situated approximately half-way between the two charming Provençal villages of Seillans (5 kms) and Bargemon (8 kms). Both have useful shops, a number of reasonable-to-good restaurants and pleasant pavement cafés. There is a smallish supermarket in Seillans and 3 larger ones in the Fayence area (12 kms). The property is about 35 minutes' drive from Exit 39 on the A8 autoroute and 60 minutes from Nice international airport. Toulon/Hyères airport (with some international flights) is 1 ½ hours and Marseilles international airport (called Marignane) is 2 hours away. The super-fast train, the TGV, stops at Les Arcs (50 minutes). A resident cook, lives in a separate, self-contained apartment below the main house and is paid by the owners to prepare/cook continental breakfasts, cold buffet lunches as well as a 3-course dinner on 5½ days a week. The half-day will usually be a Saturday when, apart from breakfast, she will, by agreement with tenants, prepare/cook either lunch or dinner. Tenants will be responsible for the cost of food and alcoholic/non-alcoholic beverages. Bed linen, bath and pool towels are provided free of charge and will be changed on a weekly basis. The cleaner is Wendy who's paid by the owners to make beds and to keep Tamasea tidy for 3 hours per day on 3 days per week. Any additional hours agreed with her should be paid direct at €18 per hour. Ron is the caretaker/gardener/pool cleaner and lives in the nearby village of Seillans. The pool's filtration system is his responsibility. Being near the summit of a hill, there is often a cool breeze in the evenings in the hotter months. There is an overhead fan in the kitchen. All 3 bedrooms and bathrooms/shower room in the Annexe and the Pool House have radiators. There is a cot (with a mattress and bedding), and a high chair. The house has 2 sets of golf clubs which can be used by tenants. The house has a good selection of English-language books and there are a number of board games as well as playing cards in the main house. There is a telephone system. Whilst the south-facing main terrace is walled and railed, below it is quite a steep drop. The dining terrace outside the dining room is also quite high above the swimming pool. Tamasea has a very useful information folder containing masses of information about the villa, local information plus important telephone numbers. Tamasea has a very useful information folder containing details of when and where local markets take place and local shops, supermarkets and restaurants in various price brackets. There is masses of information on what to do and where to go, including visits to the hugely picturesque surrounding villages. In addition, there is a helpful Tourist office in Fayence. The nearest Mediterranean beaches are at Frejus (42 kms) and St Raphael (47 kms). St Tropez is 66 kms. The journey can take quite a while in the summer months when traffic is heavy along the coast. There are 3 tennis courts in Seillans, all of which can be reserved in advance. Booking details are in the Information Folder. There are 2 excellent golf courses at Tourrettes (15 kms) where the Four Seasons Resort (called "Terre Blanche") also boasts a swimming pool, a spa, tennis courts, restaurants etc. There are several other golf courses within an hour's drive, including the excellent 18 holes at the Chateau de Taulane (20 kms). These 3, together with other courses, are listed in the Information Book. (The house has 2 sets of golf clubs which can be used by tenants). There are livery stables nearby, offering everything from lessons to dressage, to pony trekking in the surrounding countryside. There are several marvellous walks in the vicinity. Try, for instance, the walk to the romantic, almost deserted village of Bargème with its ruined castle, as well as hiking in the area surrounding it. Also recommended is a one-hour circular walk around the house - see the Information Book. Mountain and other bikes can be hired locally. Please contact the caretaker, Ron. A number of local vineyards encourage visits and "on-the-spot" purchases, and there is also a good wine merchant in Fayence. See the Information Book. The dramatic Gorges du Verdon is one hour's drive. This is the European version of the Grand Canyon, offering hiking, canoeing, kayaking, canyoning and mountain biking in abundance. A natural adventure playground. Please note a 5% reduction in rent will be made for bookings of two or more consecutive weeks duration, reducing the weekly rent from £6,940 to £6,593 per week. Enquiries are welcomed at other times of the year and will be responded to on a case by case basis at a rent to be agreed/negotiated but with no guarantee that the property will be available. This rent includes the services of a full-time, resident cook. Unless otherwise agreed, all lets will be for a minimum of 1 week, and will begin and end on a Saturday. Tenants should arrive as soon as possible after 6pm on the commencement day, and should leave before 10am on the agreed day of departure. They will be welcomed on arrival. A deposit of 25% of the rent will be payable to Anglo French Properties Ltd on signing the rental agreement, with the 75% balance to be paid 8 weeks prior to the commencement of the tenancy. The owners' insurance policy requires that all outside doors and windows are closed, and that the alarm is set whenever tenants leave the property for whatever reason. Tenants should advise the cleaner, Wendy, and the agent of any breakages, losses, and/or damages. This is in lieu of an inventory. Fires are a constant risk in the hotter months. Please therefore be very careful when extinguishing cigarettes etc in the open air, and please do not light a fire in the Pool House fireplace. Please do not smoke in the Main House or in the Annexe.